Chris posted a question on Twitter today asking for people to send him images representing our PLE (Personal Learning Environment). I sent back a flip, sarcastic response pointing to this photo set, saying that is what my PLE is. I didn’t think much more about it, but then I read later that Chris was taken aback by my (and others’) response. That surprised me, but caused me to take a step back to think about what my PLE really is, and what it would look like if I were to describe it to someone else. One of the things that I’ve had trouble with is defining what is in my PLE and what isn’t – it varies so rapidly based on context. Even within something like Twitter, there are people whom I consider part of a learning environment, and others are there for social value. They are both valid, but does that make Twitter a PLE tool or something else? Same with blogs. I follow a whole bunch of blogs – many I consider critical to my personal learning environment, but many are there for entertainment, distraction, or social value. Defining “blogs” as PLE or not-PLE isn’t a clean distinction. Even the core PLE blogs vary in content from day to day, so I can’t even provide a list of blog URLs to say “this is my definitive set of PLE-enable blogs that I follow”. 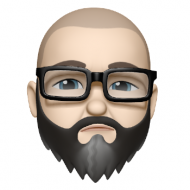 In the end, I sincerely do not mean to belittle or de-emphasize the genuine questions about PLEs – I just struggle to provide a concrete description of something that is by its very nature organic, dynamic, responsive, and intensely, individually unique. 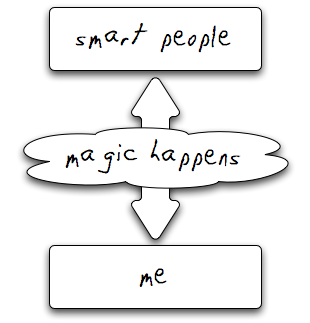 I think the more important question involves the philosophy and strategies that make various tools effective (or not) as part of the “magic happens” cloud that helps connect people. I’m not sure what the concise definition would be, but I believe that it is strongly based on real, meaningful discussions as opposed to static publishing. I believe that it involves community and real involvement and interaction between members of the community. Tools that enable these kinds of interactions are viable candidates for inclusion in a PLE – but even that definition is so vague as to be essentially meaningless. Update: I generated a new diagram with TouchGraph.com to show how my blog (which is my digital identity) fits into the context of my PLE. I am still interested in seeing if someone can describe it w/o a diagram 😉 Oh Chris did. Yes, it varies. Yes, it’s hard to show examples. Yes, it’s in flux. Yes, it will become individually unique. Isn’t that what teaching is all about? I’ve seen you posting here many times about, for example, your choice of RSS readers– even screencasting to share how to use them. I don’t see you refusing to talk about such things because there are so many choices or because, in the end, it’s really about the content of the feeds, and thus the people, not about the reader. I don’t see you hesitating to talk camera shop just because photography is ultimately about the eye and heart of the photographer. Why is it so hard to understand that people who are knew to teaching online can benefit from the very basic steps of knowing what tools more accomplished people use and how they use them? Why are educators suddenly so intent on proving that what they do can’t be taught? And why are diagrams showing where those tools fit in the process such a bad thing? I guess are moods are reversed now, because your characterization of my response doesn’t quite match what I had in mind when I wrote it. First, in my comment above I meant to affirm that this post was valuable and at the same time pose a parallel in answer to your last two paragraphs– ie that making these personal, individualized things was hard but that it was valuable in the same sense that your postings in other areas was valuable and that I recognized a kinship (I think) in that these hard to talk about areas are what makes teaching necessary and challenging. I can see that I wasn’t nearly as clear as I should have been about either. I’m sorry about that. To be fair, it was 3:30a with only a bit of tossing and turning to my sleeping credit. Wow! You’ve acctually reflected a new model of information exchange. I totally feel this shift too. I the Web 2.0 technologies do a lots for many of us today. I exchange information with my friends through blogs, wikis, Facebook. I exchange information with my team via Wrike.com. I use other social networking sites to communicate with the rest of the world. @chris: I’ve updated the post with some more detail about the physical makeup of the “communities” section of my PLE. Some time ago I bookmarked your website. Every now and then I come to read some articles. Some are interesting to me, some not. While reading some of your articles on this website, my eye was caught by this article named ‘on-the-PLE’. 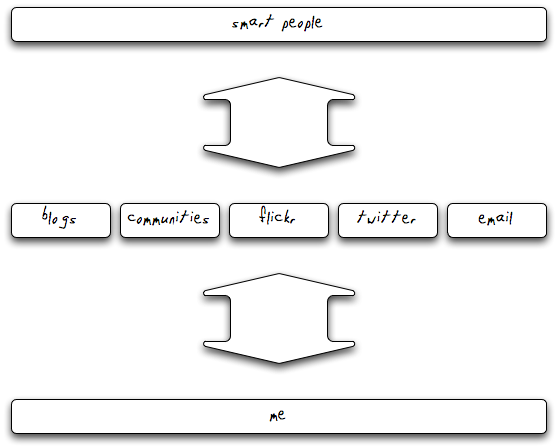 Not knowing what PLE means I deceided to start reading […images representing our PLE (Personal Learning Environment]. The image (for your PLE) that you created with Touchgraph.com is amazing. 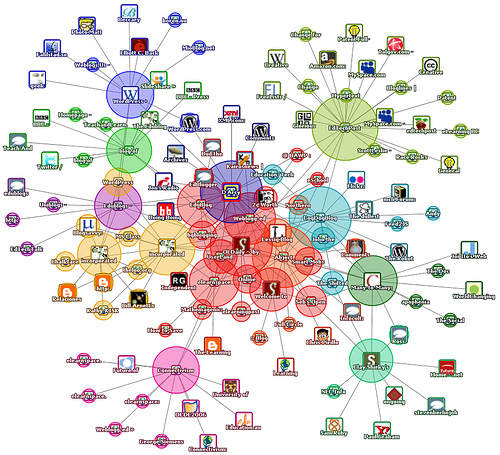 TouchGraph claims […powerful visualization solutions reveal relationships between people, organizations, and ideas. Explore the wealth of information in today’s growing data collections with our intuitive visual interfaces…]. So to me, this is an interesting article. Thanks for sharing! This is the first time I have seen anyone doing a smart flow chart and an algorithm to describe PLE ones own Personal learning environment. Well, as you said describing yor philosphy part in the second last paragraph I agree much that of it where things can not only matter to the outside community but also communiti’s thinking capabilities and the way they would react to anothers self esteem and motive. This is what concerns me more if looking towards community. Interesting stuff, this Personal Learning Environment (PLE). I am a teacher at a highschool, and I would like my students to do experiments with the touchgraph software. On the touchgraph.com website I found out that a standard license costs quite a lot of money (for me). A Desktop License with 1 year of Support and Upgrades will set me back 998 US$. Too expensive for me. Does anybody know, if there is a cheaper teacher/student subscription available?